For hybrid turbo upgrades for the tfsi engines we recommend the TTE420 turbo which can provide upto 70-80hp more delta power at the top end compared to the stock k04-064 turbos . To run the TTE420 you will basically need decent stage2+ hardware along with an upgrade low pressure fuel pump and a custom 165 bar fuel rail pressure valve and low pressure fuel pump upgrade. The TTE420 hybrid is capable of 410-43hp+ but the numbers you will see are directly linked to how well your hardware works and flows as a full package. 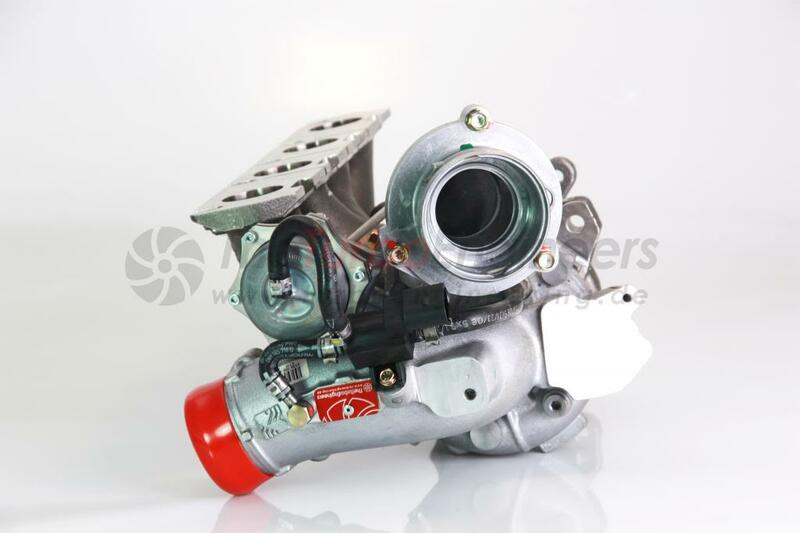 TTE420 begins as a brand new standard BorgWarner K04-064 turbocharger that we dismantle and then set about upgrading and optimizing as engineers to create the our ultimate K04 frame hybrid. TTE420 Turbocharger is in our opinion the final step and our pinnacle power stage for the 2.0 TFSI range of vehicles while retaining the OE K04 unit for Plug & Play fitment. The formula to making a TTE420 starts with a much larger 2871X TTE billet compressor wheel, chosen because is highly efficient, new generation type with ultra thin blades, creating extremely high flow for comparative size, giving a compressor map that’s very wide. The Re-Profiled compressor cover is machined to a optimized tolerance to ensure maximum compressor efficiency is given. Also the intake pipe is ported to give a smooth transition for the incoming air flow. We also fit our TTE CNC K04 silencer delete, we modify the turbo discharge silencer, removing the baffle internals and fitting a new straight through section, removing any restriction and its function as a noise cancelling device, and so improving the flow, giving less surge and enhancing the sound. A key part to driving the large 2871X compressor and in turn making this unit produce the huge power advantage over stock and also the competition, is machining and fitting a far larger BorgWarner K16 curved clipped turbine and shaft, while still keeping the k04 core, this is not so easy to do. This K16 turbine gives much lower back pressure and keeps EGT lower compared to stock K04 turbine or clipped stock. The clipping of the K16 turbine is a special TTE grinding process to the turbine blade tips, curved to alleviate stress from process. Clipping reduces blade area thus increasing gas flow and so reducing back pressure and lowering exhaust gas temperatures, allowing safer higher boost level’s. This process also gives a secondary advantage of removing some material, lightening the turbine thus reducing rotational mass improving moment of inertia. Dyno’s have shown little loss in response vs stock K04 yet huge gains in power and torque. Attention can be given to port the exhaust runners at the flange to match and smooth the transition from head to exhaust runner for maximum gas speed and so improving efficiency to the much bigger K16 turbine and so driving the compressor harder. This Process is available at extra cost. Special TTE developed in house 360 deg high performance motorsport journal bearing system is fitted. Durable at high loads with no loss in transient response. Actuator used is uprated sprung OE unit, fitted with our reinforced clamps for trouble free operation. This also can also be modified to customer needs and specifications. Precisely balancing our turbochargers is a key critical factor for longevity and performance. Good balance improves acoustics also. 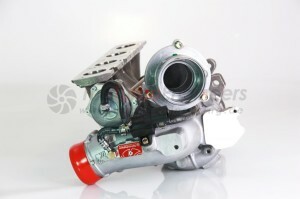 Subsequent great care is taken with all TTE turbochargers with this regard. Firstly parts are balanced at slow speeds up to 2800RPM in multiple planes using our single parts machine, then components are assembled and then the CHRA are dynamically balanced yet again but this time at up to 250,000 RPM in multiple planes using our in house VSR machine to acquire the ultimate equilibrium, to a standard far higher than OEM. Supplied with a balance test result document.